A pride of lions rules the ancient Egyptian lands in the new 30-line Pride of Egypt online slot by Konami, and they're ready to bless you with incredible wealth! Across the river nile lies 5-reels of hot slots action that offer a 96.09% RTP. Earn extra rewards with some of Konami's hottest slot features like Action Stacked Symbols, Free Games, Multipliers and a Wild substitution symbol. A pride of lions rules the ancient Egyptian lands in the new 30-line Pride of Egypt online slot by Konami, and they’re ready to bless you with incredible wealth! Across the river nile lies 5-reels of hot slots action that offer a 96.09% RTP. Earn extra rewards with some of Konami’s hottest slot features like Action Stacked Symbols, Free Games, Multipliers and a Wild substitution symbol. Wild Symbol – The Lion Pharaoh symbol is the games wild substitute and can replace all other symbols except the scatter to complete wins. Action Stacked Symbols – Each reel contains a number of adjacent positions that are randomly replaced with one of the following normal symbols in the game, before the reel spin is initiated. All replacement positions are filled with the same symbol. Copy & Paste Feature – When the same symbol appears at every position on reel 1, at least one of the remaining 4 reels will be randomly selected so that all of the symbols appearing on the selected reels will be replaced by the symbol appearing on reel 1. Free Games Feature – Land 3, 4 or 5 Pyramid Scatter to win 5, 10 or 15 free games respectively. All wins during the feature are doubled during this round. 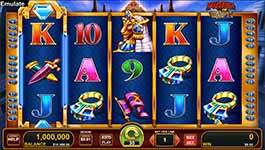 Balance of Fortune – When the Free Game feature is triggered you may commence playing free games by selecting free game or exchange the free games by selecting an immediate credit prize. The credit prize is a random amount that, on average, is greater when more free games are exchanged. During the feature, the smallest possible credit prize amount that can be displayed for the min value is 25.